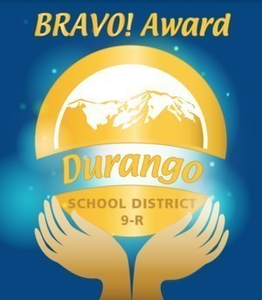 Each week, Durango 9-R recognizes an employee that has gone above and beyond expectations to serve a child, a family, their school/department or their peers. Check out who we recognized in March. The Bravo! Award for the week of March 5th went to Building Technician Rick Duran, who was nominated by Fort Lewis Mesa Elementary P.E. Teacher Chrysti Crittenden. In her nomination she wrote, "I would like to nominate Rick Duran for a Bravo! Award. He has been a substitute custodian at our campus this week, and has also subbed for us in the past. He is always extremely kind and caring. This morning I came in to my gym and he (without anyone requesting) was washing the gym floor! He mentioned he had also done a deep-cleaning of our laundry room, and our principal told me he had even done some laundry! I really appreciate that he not only subbed for our missing staff member, but went above and beyond in taking care of us here at Fort Lewis Mesa Elementary. Thank you Rick!" The Bravo! Award for the week of March 12th went to Affective Education Teacher Erik Nordstrom, who was nominated by School Psychologist Sarah Brooks and School Social Worker Robyn Klein. In their nomination they wrote, "Through his position as the Affective Education Teacher at Escalante Middle School, Erik Nordstrom provides an essential support for students struggling with social, emotional, and/or behavioral needs. He has built the Middle School AE Program from the ground up and continually seeks to increase the effectiveness of the interventions he and his team provide. It is an understatement to say that Erik gives his all, and then some, each and every day to the students on his caseload to provide the support they need. His constant refinement of the Escalante AE Program and his incredible work ethic reflects that meeting his students’ needs is his highest priority. His emphasis on a whole team, collaborative approach helps students, families, and school/ancillary staff come together to determine the most successful plans for helping his students to progress through their middle school years. Erik is such an asset to the special education team at Escalante Middle School and an inspiration for those who get the opportunity to work closely with him. Thank you for all you do Erik!" The Bravo! Award for the week of March 19th went to the DHS Athletic Team of Ann Duft, Adam Bright, and Aaron Champenoy, who were nominated by DHS Principal Jon Hoerl. In his nomination he wrote, "Adam, Ann, Aaron and many parent/teachers/volunteers pulled off an amazing CHSAA state ski championships this past week! In addition to all the planning and preparation that went into the event, the group did an amazing job adjusting on the fly with the snow apocalypse. They raised the bar in terms of the actual event, hosting an opening ceremony with the teams skiing down Chapman with lanterns and then followed up with fireworks and provided a chance for families and athletes to ride the train on Thursday evening. The DHS Athletic Department illustrated in every way what a top notch event should look like for our student-athletes, including a catered dinner and awards ceremony held up at Fort Lewis ballroom. While everyone else was digging out during the two snow days, the DHS Athletics department worked tirelessly to showcase our beautiful city and all it has to offer while running a superior event. This is an incredible team that often flies under the radar and does so much for our school to provide each and every student a comprehensive high school experience. They are an awesome part of the DHS family and certainly deserve to be celebrated!" Great job, Ann, Adam, and Aaron!